4 Bedroom Detached House For Sale in Sheffield for Guide Price £630,000. Have you ever dreamed of waking up to endless views, whilst still being a stones throw away from local amenities and fantastic Motorway links! Escaping the rat race and relaxing in the charm and beauty of your own home. 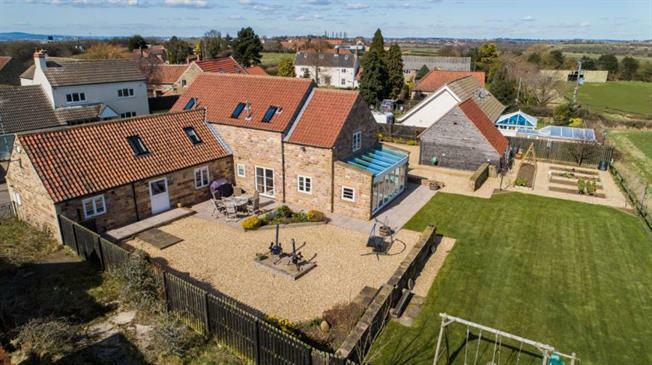 This Characterful 4 Bedroom Detached Barn Conversion has it all!, Sympathetically refurbished throughout and extended by the current vendors to the highest specification, only truly upon internal inspection can this stunning family home be fully appreciated. The original Barn has been significantly extended and now provides stylish accommodation over two floors; the feature reception hallway boasts a 'floating' solid oak and glass style staircase. To the ground floor the Hallway leads to the Study, Snug/Family Room offering potential for further conversion to a separate annex. The Stunning Living room with Bi Fold doors offers breathtaking views over towards Harthill. Further from the Hall is the Cloakroom/W.C and the Dining/Kitchen the 'Hub' of the home fitted with a range of high gloss wall and base units with integral appliances, central Island and solid granite worktops. The Dining area is crowned by feature beams blending the old with the 'new' to dramatic effect. Further generous utility room fitted with a range of wall and base units with a beech shaker style frontage, integral sink and gas hob. A door leads to the Plant room. To the first floor the Master Bedroom with walk-in wardrobes and en-suite Shower Room takes in the same delightful views over towards the reservoir and open fields. Further Guest bedroom 2 with En-Suite Shower Room, Bedroom 3 with outstanding views is serviced by the Jack and Jill style Family Bathroom. Further 4th Bedroom. The property occupies a generous plot, with gravelled driveway providing ample off street parking for multiple vehicles leading to the detached Double garage with further room above offering superb potential for further conversion subject to planning permissions. To the rear of the property is a delightful Garden taking full enjoyment of the views beyond, laid predominantly to lawn with further Gravelled and decked patio areas perfect for 'Al Fresco' entertaining. Woodall is a small hamlet in the civil parish of Harthill. A once tiny settlement consisting of but a few farms and barn buildings, over the 20th and 21st centuries the hamlet grew substantially and consequently is now a quiet residential area popular with commuters to the nearby town of Rotherham and the city of Sheffield. Harthill lies between Killamarsh and Thorpe Salvin and is ideally placed for local Schools and amenities. Traditionally an agricultural village Harthill offers a semi rural lifestyle whilst being a stones throw away from the nearby hustle and bustle. Ideally situated between both junction 30 and 31 of the M1 Motorway.